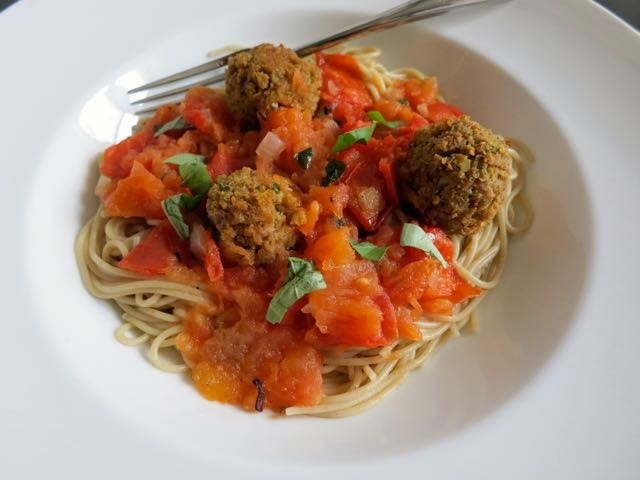 Seeking a way to dress up a simple pasta dish, I turned to the seitan wheatballs described in the Candle 79 Cookbook . Made with shallots, onions, celery, and seitan, these wheatballs had some great flavor that was enhanced with red pepper flakes and fresh chopped celery. The cooking method described below will steam them so that they are very soft. I prefer them to be a bit more on the baked side so I uncovered them and baked them for an additional 5-10 minutes. 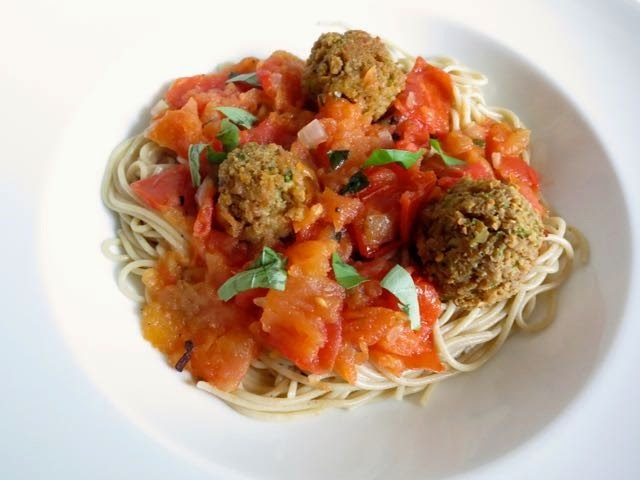 These wheatballs are a great addition to a simple spaghetti dish with roasted tomato sauce. Preheat the oven to 350-degrees. Brush a rimmed baking sheet with olive oil. To make the wheatballs, heat the olive oil in a saute pan over medium heat. Add the garlic, shallots, onion, and celery and saute until softened, about 5 minutes. Set aside to cool. Put the seitan in a food processor fitted with the metal blade and process until completely ground. Add the red pepper flakes, parsley, and salt and pulse to incorporate. Add the sauteed onion and celery and process until completely ground. Transfer the seitan mixture to a large bowl and stir in the flour. Roll the mixture into 1-inch balls and put them on the prepared baking sheet. There should be about 20 balls. Brush the balls with olive oil and put 2 tablespoons of water into the baking pan. Cover with aluminum foil and bake for 25 to 30 minutes. Remove from the oven. Meanwhile, bring a large pot of water to a boil and cook the spaghetti until just tender, 8 to 10 minutes. Drain well. Heat the tomato sauce on the stovetop until warm and bubbly. Portion the pasta into individual bowls and top each serving with tomato sauce and wheatballs. Garnish with basil and serve warm.